Military Pins CLOSEOUT - All pins are on sale! “grab bag” Buy random pins for $1 ea.! Only $2.12 each! *LIMITED TIME! We are closing out many pins and all official medals. Everything is currently on sale at closeout pricing! Any pins you may purchase but are sold out, will be obtained for you from a backup source (if available), or the cost will be credited back to your Paypal or credit card account. * Sold out designs will be removed from our listings ASAP. Priority shipping is $7.50 for any quantity. 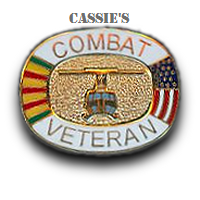 A custom veteran/flag pin (as below) will be included in every shipment at no charge. Check out http://custompins.us for custom pins, coins, keyrings and jewelry of your own designs. Don’t See What Your Looking For? 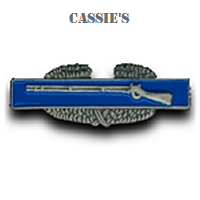 Cassie's also offers custom pins starting as low as $0.68 each! Cassie’s takes pride in serving you as a valued customer for life – with fairness, respect and appreciation.